Gold plated contacts ensure a low loss contact for the best picture quality. 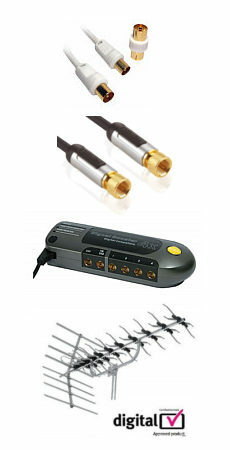 An adapter for joining two stereo 3.5mm cables together. A scart coupler / joiner for joining two scart leads together. Black plastic body with a scart socket each end. Ideal for joining scart leads to make longer runs. VGA Right Angle Adapter, SVGA 90 Degree. Right angle VGA adapter, male to female 90 degree VGA / SVGA adapter. Male to female adapter, ideal for turning a VGA cable to a right angle VGA cable. HD15 Male D connector to HD15 female connector. 6.35mm Mono Plug to 3.5mm Mono Socket Adapter. 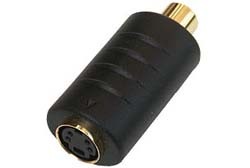 6.35mm mono jack plug to 3.5mm mono socket adapter. Nickel plated. 6.35mm (1/4") Male plug mono to 3.5mm (1/8") female socket mono. Pack size 1.